Terpsicore vacations in Maine | The New York Baroque Dance Co.
After Armide had such a good time at the Bates Dance Festival last summer, Terpsicore decided to try it out, too. I was able to introduce her to the BDF community when I performed an excerpt from Catherine Turocy’s version of the Handel opera Terpsicore during the Faculty Gala on August 5. The audience gasped audibly (don’t you just love that?) when the curtain went up revealing my beautiful new costume made by Deirdre McGuire and Lisa Marzolf. 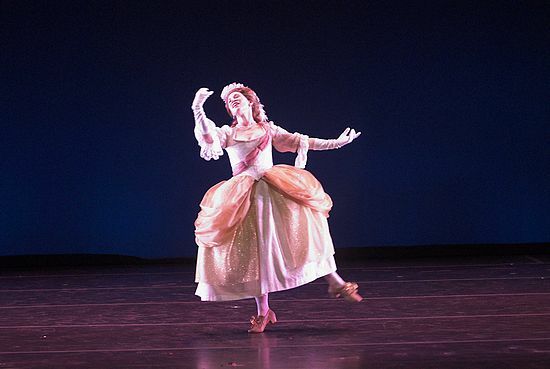 (Of course, it’s not too hard to make a splash when the rest of the concert is being performed in more pedestrian, modern dance attire…) Audience members who had seen Armide last year said they were pleased to see an “unmasked” dance this year, for contrast. In the opera, Apollo and Erato ask Terpsicore to portray various states of love. For this performance, I danced three sections. The first, a sarabande, is supposed to portray “noble and compassionate” love. The second, a rather melodramatic pantomime, illustrates jealousy. The third, a gigue, is meant to show the joys and intoxication of young love. It is, of course, a challenge to dance and act at the same time. Catherine and I had a great coaching session shortly before I went to Maine and Caroline Copeland, who has recently performed the entire role with the NYBDC, also gave me some extremely helpful advice and insights. I hope everyone had as delightful a summer as Terpsicore did in Maine.